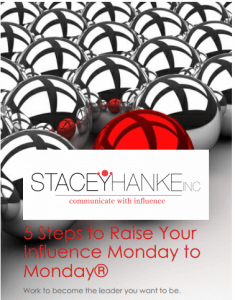 Virtual Excuses -5 Surefire Ways to Increase Your Influence | Stacey Hanke, Inc. The No. 1 challenge our participants share during virtual conversations is thinking, “I don’t know if my listeners are with me or checking their emails.” There are steps you can take today to increase interaction and your influence during all virtual conversations. 1. Turn on your webcam. We live in a world of advanced technology, so let’s use it. When you and your listeners can see each other, the biggest challenge of not knowing what is happening on the other end disappears. Everyone moans and groans when I make this recommendation because they don’t like to be seen. Really? People see you every day! If you’re really serious about the influence you want to have Monday to Monday,® turn on your webcam this week for at least five conversations. 2. Ask the right questions. The best way to increase interaction is by asking open-ended questions. “Do you have any questions?” won’t encourage interaction. Create the reputation of being engaging and interesting. Individuals will begin to show up for your virtual conversations ready to interact rather than thinking they can catch up on email during your calls. 3. Call them out. Maybe not literally. Rather, use your listeners’ names. “Michael, what has been your experience with our client ‘X’?” Everyone else on the call will sit up and take notice of your interactive style. 4. Get organized. Always have an agenda and distribute the agenda at least 24 hours before the call. At the beginning of the call, explain the purpose of the call and your expectations, your role, the participants’ roles and what needs to be accomplished. Explain to participants: “To make this call efficient and to respect your time, we’ll need your participation. I want to make sure everyone is clear on his or her individual action steps moving forward. Therefore, I’ll be asking questions throughout the call for everyone to answer.” In order to reach results and to make sure you’re on track as the facilitator, everyone needs to participate. 5. Respect your listeners. Start and end on time. When you go beyond the scheduled time frame, you communicate to participants that their time is not valuable. Drop me a note to share the action steps you will commit to this week to create an interactive, interesting and impactful environment while leading virtual conversations. Tag me on my Facebook page. Great read! And awesome reminders. In MPI we do everything virtually … I’m sharing with our board. Thank you! Thank you for sharing Judi! I’m so glad you found the article beneficial! Awesome post! It takes work to be memorable in the room or in your audience. I personally like #1. We should stop being paranoid and start communicating in video. Communication is much more effective if you could see your audience face to face.